Everybody’s favourite giraffe! 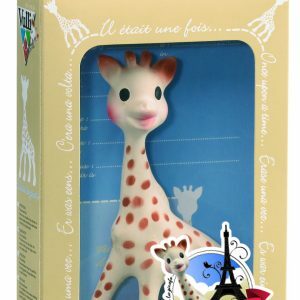 The little giraffe was born in France in 1961, and continues to be cherished by children today all over the world! The original Sophie la Girafe teether is made with 100% natural rubber and food grade paints. There are both soft and bumpy parts to soothe baby’s gums, she is light and easy to grip and squeaks when pressed to stimulate baby’s hearing.